Angus Reid has put out a new poll giving the Conservatives a 34-30 lead over the Liberals. There are some interesting numbers from almost every region: the Tories are only at 20% in Atlantic Canada; the Grits and the Bloc are tied in Québec; the Greens are ahead of the NDP in Ontario (Cons and Libs par for the course there); the NDP is strong while the Liberals are weak in MB/SK. But by far, the most striking numbers are in BC, where this poll has Conservatives 43%, NDP 28%, Liberals 19%, Greens 10%. The Tory result here is even better than the one in the Ipsos outlier (38%), while the Grits are even lower than the 20% they got in Harris-Decima's weird poll (that gave Greens 24% in BC). Incidentally, this is a low number for the Greens in BC, which is bad news for them since Angus and Nanos were the two firms that did not over-poll them in the last election (Nanos had them at a poor 11.1% in BC in its latest poll). I have the NDP at the same number of seats as in 2008 (which is 8 more than in 2006) even though their national numbers are about 2% lower than in 2008 (and about 1% lower than in 2006). Essentially, the two provinces that matter for the NDP are BC and ON. In BC, compared to 2008, polls show the Tories losing ground and the Grits gaining support, while the NDP is roughly flat. Since most NDP contests in BC are with the Conservatives, this makes them gain seats. In ON, NDP losses are limited by the fact that many of their seats were won by a pretty comfortable margin in 2008. Furthermore, the fact that I use an arithmetic swing rather than a geometric swing helps the NDP retain most of their seats in my Ontario projection; I view this as reasonable since the NDP may benefit from being newly incumbent in most of their tight Ontario races. No November Election After All? So it looks like, once again, the Liberal party is divided, though a previous report of Liberals wanting to pull the trigger was based on anonymous sources. Still, I do think that many Grits are very wary of Ignatieff being "Dionized" if he keeps bending, and tell themselves that while neither the numbers nor the state of the party's organization are great, they aren't disastrous either. Keep an eye on that Ontario number in the polls. The Liberals will likely be happy to pull the trigger if they manage a consistent 5% lead there. First, the weekly EKOS has come out, and doesn't show much movement relatively to last week. 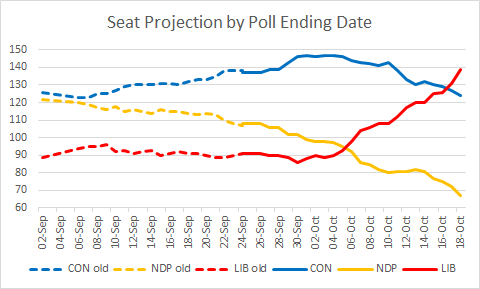 The two changes are that the Tories are back ahead in BC (by 3.3%, which is still worryingly low for them), while the Grits opened up a big lead (17%) in Atlantic Canada, but both these are likely due to sampling noise. Nationally, the Conservatives lead by 1.7%, while there's an exact tie in Ontario. Second, CROP has published a Québec provincial poll, putting the Bloc and Liberals tied at 30%, followed by the NDP at a surprisingly high 18%, and with the Tories 4th with 17%. Unfortunately for the NDP, their 18% seems hopelessly uniformly distributed, which means that even if this result is borne out on election night, they probably would still get very few seats in La Belle Province. More importantly, according to this poll, although the Tories have lost less ground than the Bloc provincewide, they are now significantly behind in the Québec City area (Bloc 33, Lib 24, Con 23), which they carried last time. A CROP poll in June also had the Conservatives trailing (33-22) in that region. This means that apart from the seats in Chaudière-Appalaches and Louis-Saint-Laurent (Josée Verner), every Tory seat in Québec is in jeopardy. This projection includes (at a discount) Angus, Nanos and Strategic Counsel polls that are several weeks old. But just including the last two EKOS and the last Harris-Decima would yield very similar estimates, so I'm comfortable with these numbers. The regional breakdown, except for MB/SK/AB, can be found in this writeup. Update: The full results are now available. It turns out that Harris-Decima continued weekly polls all summer, but played coy with the results, perhaps because the national numbers were mostly flat. The most eye-catching number here is the 24% for Greens in BC. However, even with 24% in a four-way race, the basic arithmetic swing model gives them no seats. Of course, if the Greens truly have that much support, Elizabeth May would probably win her riding; furthermore, the support is likely to be unequally distributed, which would net the Greens some seats in the Lower Mainland and on Vancouver Island. Now, they probably aren't anywhere near 24% in reality: their best poll all year in BC had them at 16.3%. Of greater consequence seatwise, the Grits are 6 ahead of the Tories in Ontario, which must be reassuring after Ipsos had them 12 behind. Bad news also for the Conservatives in Atlantic Canada (23%), Québec (12%) and BC (28%), as well as for the Liberals in BC (20%, probably due to the Green surge). The NDP gets solid numbers in Atlantic Canada (32%) and BC (26%), but does poorly in Ontario (13%). My inkling is that the Liberals are actually a bit higher, and the Tories a bit lower. But I'll wait for more confirmation that the Ipsos poll is indeed a fluke before more heavily discounting it. Here's an encouraging Harris-Decima poll for Greens: 40% of BCians, 49% of Libs and 53% of NDPers want to see May in the next Parliament. What does this mean? For one thing, since this question isn't asked regularly, we don't know if this represents an increase or a decrease. I would interpret the result as follows: at most half of Liberal and NDP voters would switch their vote to the Green Party if May ran in their riding. Greg Morrow at democraticSPACE has an excellent post about projecting the outcome in Saanich--Gulf Islands. 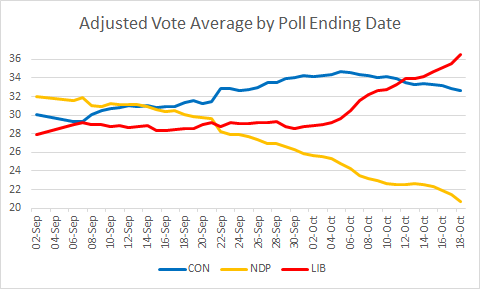 Since that post, the polling in BC has worsened a bit for the Tories, and improved for the NDP. Also, I'd be a bit kinder to the Liberals at the expense of the NDP in that riding: some NDPers that switched over to the Liberal Party last time might decide to stick around. So if Elizabeth May weren't running in the riding, I'd say that things there now stand at about CPC 34, LPC 26, NDP 22, GPC 17. If May indeed manages to draw half of LPC and NDP voters, she'd win. But of course, that's a bit unrealistic. My own very unscientific guesswork for Central Nova suggests that May drew 40% of NDP voters there in the last election. If she manages to draw 40% of Dippers and 35% of Grits this time around, she'd end up basically tied with Gary Lunn. However, Greg Morrow, who has been involved with the Green Party and studied these issues more carefully, seems to think that May will only draw 25% of NDPers and 10% of Grits. The prognosis for May in that case is rather poor. This estimate is partly based on the fact that Ed Broadbent got an 8% bump in Ottawa Centre. I would venture that as a current party leader, May has more pull than Broadbent. In summary, if May can "max out" and pull 50% of Liberals and Dippers, she has a good chance of winning. If she can only get 20% of them, it'll be a hard slug. For my projections, until a riding-specific poll comes out, I will use a proportion of 30% - somewhere between Greg Morrow's model and my back-of-the-envelope calculations. Currently, that's not enough for May to win, but she's close! Also, Harris-Decima just put out a national poll (8/13-23, 2000+ respondents) today, but full details aren't available yet. From what I was able to glean from news websites, the headline numbers are: LIB 32, CON 31, NDP 16, GRN 11, BQ 9. In Québec, the breakdown is: BQ 37, LIB 28, CON 12, NDP 11, GRN 10. Unfortunately, I haven't been able to find the all-important Ontario breakdown... Hopefully, Harris-Decima will soon post the full results (or maybe the Canadian Press will decide to write a more detailed article on the poll), so that the projection can be updated. But at first glance, this poll might be the first indication that the recent Ipsos is indeed an outlier - we will have a better idea when the regional breakdowns and this week's EKOS become available. Projecting based on this poll alone gives a slim Conservative majority, with the three other parties losing about 5 seats each. Normally, the Tories need a bit more for a majority, but the unusual Ontario result changes that. However, if more recent polls from other firms confirm that this Ipsos poll is a strong outlier, I will depreciate it more quickly than I usually do. The weekly EKOS is out, and shows roughly the same results as last week, with the NDP up 0.8%, the Liberals down 0.8% and the Tories up 0.1%. The Conservatives lead overall by 2.6%, and the NDP polled a strong 17.3%. The regional breakdown, however, is quite worrisome for the Grits. After several polls showing them ahead by 3-4% in Ontario, this one suggests that their lead is down to 0.9%. Now, given the smaller regional sample size, this could just be a statistical fluke, but given how consistent the Ontario numbers were since the start of August across all pollsters, it's a noticeable bump. If Ontario ends up anywhere close to being tied on election night, the Liberals can probably kiss their chance of forming government good-bye! Now, the Tories didn't actually increase their support in Ontario: the Grits instead bled support to the NDP and the Greens. Moreover, the NDP has gone up for the 3rd week in a row in Québec, and is now back where they were last year - thus increasing Mulcair's chance of retaining his seat. The only good news in this poll for the Liberals is in BC, where they lead the two other parties by about 5%. But at this point, I'd say that this is almost certainly statistical noise, though the Tory lead there does seem more and more fragile. And in any case, there are a dozen Alberta-like seats in BC that the Tories can't lose unless something totally freakish happens. That, combined with a few NDP strongholds, limits the Grits' potential for growth: even if they truly lead BC by 5%, they would probably still only get 10-12 seats. So Liberals shouldn't get too excited about this glimmer of light out West. If the top two numbers look familiar to you, it's because they're identical to the ones from the 2006 election. Looking at my projections over the past few weeks, the Tories are stuck around 125, the Libs bounce around 105, while the Bloc is flat at 46 and the NDP inched up from the low to the mid-30s. Will the fall bring us some significant movement? According to several Liberal strategists interviewed by La Presse, a fall election is on. That is, if the Bloc and NDP go along, and it's pretty hard to see how that wouldn't happen. This is of course unsurprising, given that for the Grits, the downside of keeping the government alive now seems to clearly outweigh the upside, and the polls indicate that they are likely to make major gains, and have a decent chance of winning. A fall election would most likely take place on November 9. Two new polls are out: a Strategic Counsel poll from last week, and the EKOS poll for this week. They show an overall Conservative lead of 2% and 1.7% respectively, which fits into the recent trend. Sadly, Strategic Counsel polls are not very useful for projection purposes: they do not provide Atlantic Canada numbers, their Québec numbers tend to be out-of-whack, and they lump all Western provinces together. In Ontario, this poll shows a 3% Liberal lead, which is almost spot on the recent poll average. The EKOS poll also asked if Canadians would prefer a two-party system. They were quite split on the question, with a slight majority (56%) answering 'no'. Variations across political parties weren't huge: unsurprisingly, the Tories were more open to a two-party system, while the NDP and Greens were less so. Liberal voters were also less prone to support a two-party system, perhaps because their base consists disproportionately of university degree holders, who strongly oppose such a system (66%). The surprise was that Bloc voters were actually the most receptive to a two-party system (51%)! Perhaps in their mind, a two-party system means BQ vs. Lib in Québec. Or maybe a lot of them would actually rather vote Liberal or Conservative, but are voting Bloc strategically. The poll also gave the following approval ratings for the leaders: Stephen Harper is at -11% (36-47), Michael Ignatieff is at -9% (29-38), while Jack Layton barely eked out a positive number at +1% (34-33). Not surprisingly, approval figures for Harper and Ignatieff mirror party support across the country. Layton is at around 30% everywhere, except in Québec where he's the most popular federalist leader at 40%, even though the NDP will be hard-pressed to win more than 1 out of 75 seats there. Own party approval ratings are not great for any leader, and especially low for Ignatieff (Harper 79%, Layton 68%, Iggy 59%). Iggymania is definitely over, even among Grits! By contrast, President Obama's net approval rating among Canadians is a whopping +62% (73-11). Liberals especially like him (86-7), while Conservatives are less supportive (still 66-17). Finally, 87% of Canadians believe that Canada has a better health care system than the U.S., while only 7% believe the contrary. That 87% is a combination of 80% in Québec and around 90% in all other regions (even Alberta). Like last week's EKOS poll, this one shows us that Quebecers are not as left-wing as their voting patterns or provincial politics suggest. The problem for the Tories is that Québec conservatism is entwined with Québec nationalism, which necessitates government interventions to support the arts and preserve heritage; the Conservative base is probably the most hostile of any party's to both Québec nationalism and government subsidies. Meanwhile, I think the ADQ wouldn't have fizzled out if it had a more credible team - but that's of course a chicken-and-egg problem. The first non-EKOS-or-Angus national vote intention poll in over a month just came out, from Nanos. The results (accessible here) show a 2.5% lead for the Liberals. Also, the NDP has a strong showing: 18.7%. Both these findings contrast with the EKOS poll's from last week, even though the two polls were done during roughly the same period (7/29-8/4 for EKOS, 7/30-8/2 for Nanos). Regionally, as is customary with Nanos polls, the Grits are stronger than usual out West, especially in BC where they come out ahead of the Tories. However, this strength in Western Canada is mostly wasted on the Prairies and in the BC interior, so my model actually still spits out a small Tory minority based on this poll alone. Indeed, the 3.4% lead for the Liberals in Ontario is insufficient to put them ahead of the Tories, especially when the NDP is strong, as is the case in this poll. This small movement is due first and foremost to the fact that I'm using the last 3 EKOS polls (though discounting the oldest), since only two firms are polling regularly over the summer. Thus the latest poll replaces not data from last week, but from mid-July, which wasn't that great for the Grits either. Also, although the Tories went from -1.6 to +3 in the national numbers from last week to this week, they only improved from -4 to -2.7 in all-important Ontario. Other interesting regional snippets include the 19% result for the Tories in Québec (their best in a long time), and the 29% result for the Grits in Manitoba/Saskatchewan (confirming their strong showing in both of last week's polls). The day-by-day numbers actually show the Liberals leading last Wednesday and Thursday, but falling behind on Friday, and trailing badly this Tuesday. I guess we'll have a better idea next week if this is a fluke or a trend, but can you think of anything drastic happening toward the end of last week or over the weekend? The poll also asked Canadians to rate the economy. 74% say that it's still in a recession, and the rest are split almost evenly between depression (12%) and growth (14%). Quebecers are the most pessimistic (even though the downturn is likely quite a bit milder there than in Ontario), while Mabitobans/Saskatchewanians are the most optimistic. Bloc and NDP supporters are very downbeat, while Tories seem happier about the economy (still, only 19% of them see growth). My guess is that left-wingers tend to be more risk-averse, and thus more sensitive to small changes in income than right-wingers. This would explain both these sets of results. Also, despite study after study from Statistics Canada, Canadians are almost twice as likely to believe that crime rate in Canada has increased rather than decreased over the past 10 years (48%-26%). Quebecers were most likely to be right, while residents of the Prairies and Atlantic Canada were most likely to be wrong. However, in all regions, more people believe that crime has increased than decreased. Unsurprisingly, more educated people were right more often, but even people with a bachelor's degree were slightly more likely to be wrong than right (37%-35%). The undecided voters were most paranoid, followed by (roughly tied) the Tories and the Greens (! ), while Bloc voters had the most accurate perceptions, followed by (roughly tied again) the Grits and the Dippers. When asked what to do about crime, Canadians favoured the Stick (more police, longer jail terms) over the Carrot (crime prevention, rehabilitation) by 53%-42%, though people with a university degree thought the opposite by 56%-40%. 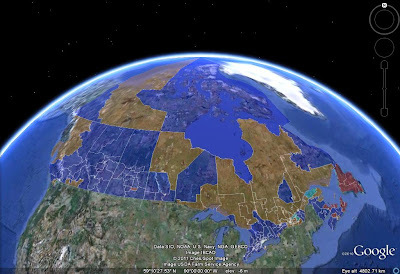 Regionally, BC, MB/SK (!) and ON voters were somewhat softer (roughly 50-45) than AB, QC (!) and Atlantic voters (about 57-38). In terms of vote intention, from toughest to softest, we get Conservative, undecided, Bloc, Liberal and NDP (basically tied), Green. The NDP may soon decide to drop 'New' from their name. Attempt go get closer to the Obama halo? 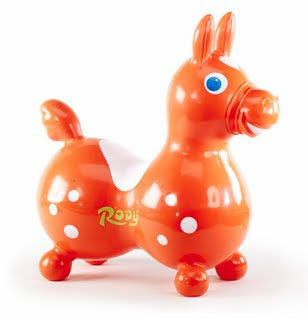 And would the new logo be an orange donkey?